Sorry, we will close this shop from April 1st, 2016. Thank you very much. Please e-mail to info@hoetljapan.jp for further information. If you are tired of hauling your luggage, why not let your luggage haul you? This is something you can do with the “Micro Luggage,” an innovative collaboration between Micro Mobility and Samsonite that combines a compact suitcase with a built-in kickboard scooter. This invention allows you to move together with the luggage you would otherwise be carrying; it is at once practical and whimsical, taking full advantage of the functionality inherent in the wheels of both a suitcase and a scooter. The more you think about it, the more it makes sense. Exploring the boundaries of funtionality, this invention will make the long trips between terminals more fun, adding an element of amusement and speed to something that is otherwise stressful and hectic. There is something even more special about the model we have chosen. It has been designed by Steve Aoki, the renowned American DJ, music producer, and owner of record label DIM MAK, whose influence extends far beyond the music world. For this collaboration, Aoki shows true commitment to thorough design, even integrating a Bluetooth speaker for maximum enjoyment. 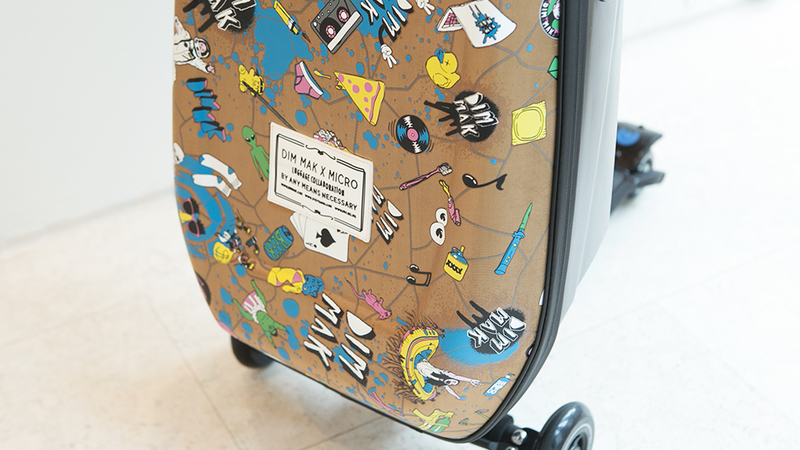 Every aspect of the design, style, and added functions of the DIM MAK x MICRO are truly representative of his talent. Wood has long been the material of preference for timepieces such as Grandfather clocks, mantle clocks, and wall clocks. But when it comes to wristwatches, metals and plastics are the norm. 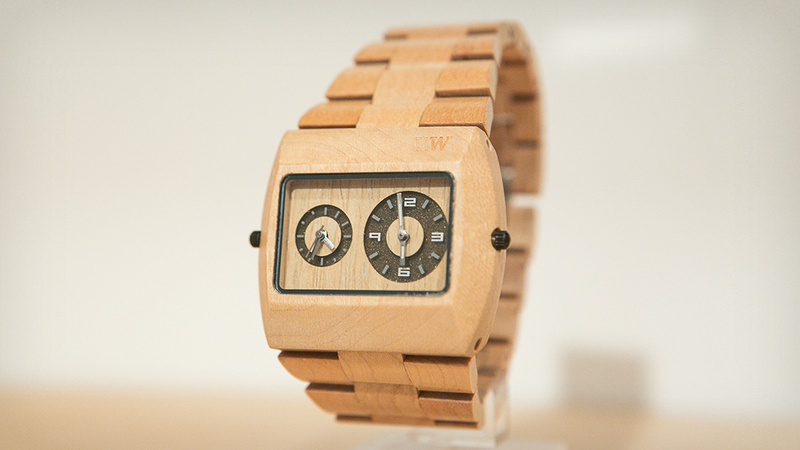 WEWOOD is the exception, moving away from the cold feel of metals and plastics and instead using wood to create watches that are soft and pleasant to touch. For the Jupiter Beige watch, WEWOOD uses maple from trees initially harvested for other needs, helping them find a new life as finely crafted accessories for the environmentally conscious. Part of the charm is that no two wooden watches will be the same: special treatment of materials during the crafting process ensures that the unique quality of each piece of wood is identified and brought out. The moment you slip one on your wrist, you will be mystified by how instinctive it feels. The watch is so warm, natural, reliable, and functional that it starts to feel like an extension of your own body. This is the beauty of a perfect blend of nature and technology. The Jupiter Beige is a device that tells time yet is thoroughly timeless. The Monkey Incense Stand consists of a tin dish upon which a darling bronze monkey sits with his hands open, ready to hold an incense stick. The beauty of this set lies in the high-quality materials and the careful way in which it has been crafted. In order to achieve its unique light brown shade, the bronze monkey was boiled in special chemicals. 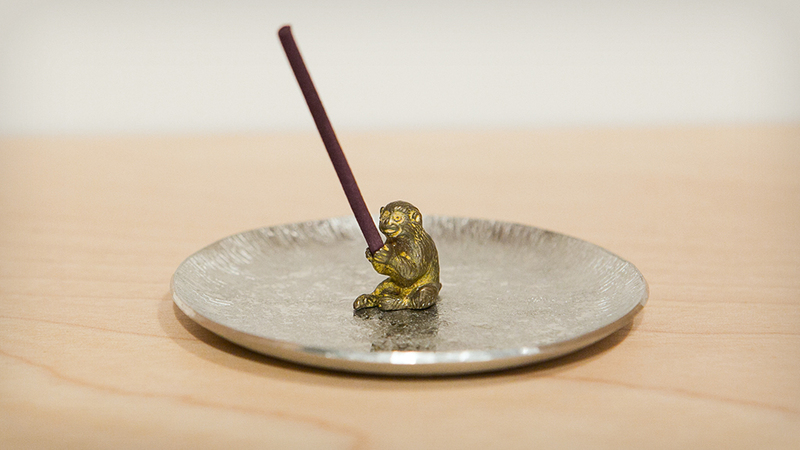 The beautiful synergy of the light brown monkey and the shiny tin dish allows the residue from the burning incense sticks to fall onto the stand without looking unclean. In addition, since the monkey is not attached to the dish, you can easily clean each part. 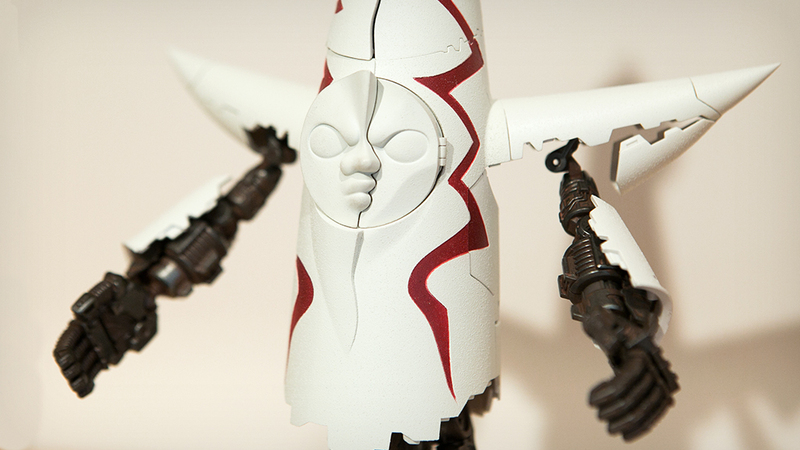 The Tower of the Sun Robot is a Chogokin toy modeled after the “Tower of the Sun” pagoda built for the 1970 Osaka World Fair. The charm of this toy model is that at first glance it appears to be an exact replica of the pagoda, but upon closer inspection you can see the discrete cracks dividing the tower. All you need to do is pull out the robot’s hands from the pagoda’s arms and pull on the bottom to reveal the legs, and the pagoda morphs into a robot. There is nothing complicated about the transformation so you can play around with it at your leisure. Nevertheless, the impact is strong and the toy’s countless other hidden features will not cease to surprise you. 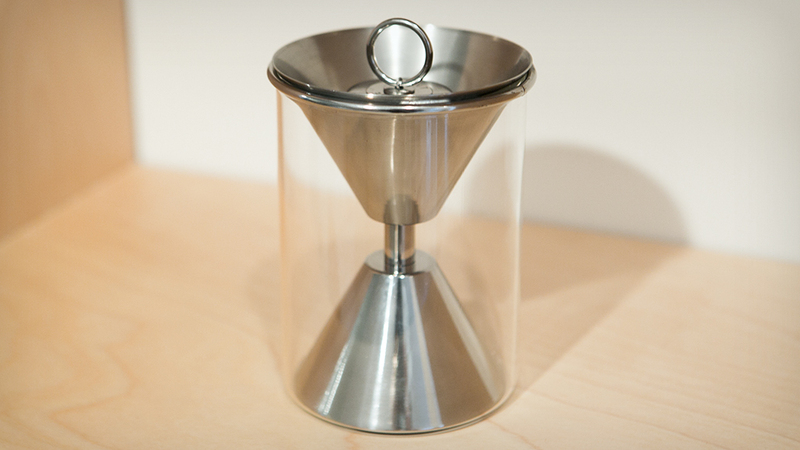 The Ash Glass was conceived and created when two interior designers from Phyle Inc. were playing around with funnels used for cooking and found that when placed on top of each other, they resembled an hourglass. The designers did not have any prior product design experience, but with the help of 3D printers they could utilize their interior design expertise to create the product of their imagination. The result of their work is an hourglass ashtray made from stainless materials that can be completely disassembled, allowing for it to be easily washed. Its unique design allows the cigarette butts to drop straight to the bottom while the ashes fall along the contours of the hourglass. Imagine small, delicate flowers dancing in the air and fluttering to the ground. It is this precious scene that has been captured in clear acrylic, a material that invites light to meander and shine through. 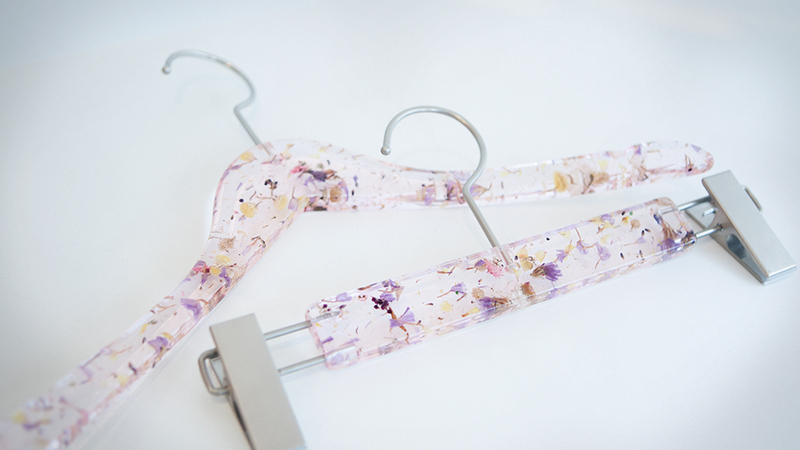 What is captured in these hangers is evocative of a dozen different flowers fluttering in spring winds, blooming in all different directions. Yet at the same time, the flowers seem to have been frozen at the very instant they bloomed to perfection. For a brief moment, you can be transported to this strange and miraculous landscape through your very own eyes. Of course, the real mystery of this scene is the fact that it exists within a hanger. The magic can be attributed to the manufacturer, ANREALAGE, whose concept is beauty lies within the details. It is enchanting how this mix of dried flowers and acrylic, bound in such a small space, can extend so far beyond to such a boundless and magical place. At first glance, the accessory appears to be a cute ornament in the shape of a skirt - a true “head dress” if you will. But upon closer inspection, you notice the skirt provocatively blossoming open to reveal two flirtatious legs of a young lady. In an instant, a feeling of voyeuristic guilt shoots through your veins. Even though you know that the hair clip is not real, you cannot help but feel as though you saw something you were not meant to see. And although there is nothing to view past the playful legs, you can use your imagination. Young men in particular will be tempted to take a closer look but will be too embarrassed to gaze at it directly. Artist Momoko Fukaya toys with the power of suggestion in order to create this naughty scenario, tantalizing us and playing with our feelings, almost like a criminal taking pleasure in people’s reactions to her crimes. Imagine a farmhouse shed overflowing with an assortment of wood, glass, metal, and many other objects and materials. 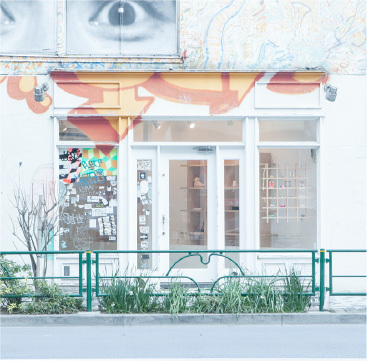 This site is the studio of Teruo Sawayama. Sawayama selects and combines materials from this collection in order to create original gadgets and gizmos that are bizarre yet functional. For example, his dog-shaped speaker, “Singing Sebastian,” sings in a slow and slightly muffled voice from his open mouth, or his “Chair Mill,” is a bench that has been integrated with an operating coffee mill. The “Monkey Phone” is a particularly delightful creation. Its wooden monkey-shaped receiver has a cord extending from the bottom as its tail, connecting it to a wooden base with mismatched buttons and handwritten characters while an old metal bell sits to the side, functioning as the phone’s ringer and adding a very appropriate finishing touch. The Monkey Phone boasts an aesthetically rustic and handcrafted quality, but it is nonetheless a functioning phone that even has a redial button. And although it is comprised of various odd elements, the finished product has an innocent simplicity to it. This is the craft and spirit of Sawayama. Have you ever encountered a figure that walks smoothly on the beach with just a push from the wind? 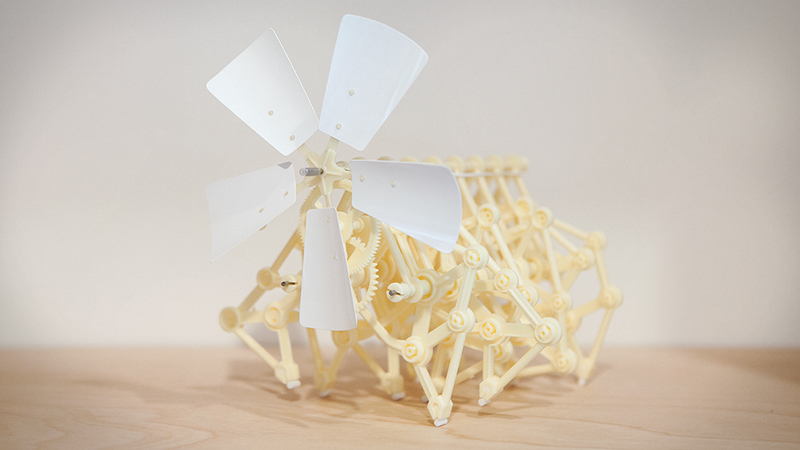 The Strandbeest is a kinetic, wind-propelled “new form of life” that was created for that exact purpose. Dutch artist Theo Jansen, known for his fusion of art and engineering, dreamed up the concept of having self-sustaining mechanical figures roam along the beaches near his home. Using a sail and an assemblage of PVC piping that calculates rod length and pivot point positions in order to create a specific foot path, he created his first Strandbeest. For twenty years, Jansen has worked on improving the animals so that they will eventually be able to survive entirely on their own. For example, in a later version he attached a hose to the nose of each beast, which allowed it to sense when it got too close to water, alerting it to change directions. You can now experience Jansen's incredible new form of life in your very own home with the mini Strandbeest, which uses the same mechanical system in order to walk smoothly. It is mystifying how without any electronic parts, this creature can walk in a manner that is at once momentous and organic. The longer you observe this mechanical animal, the more it seems to truly have a mind of its own. 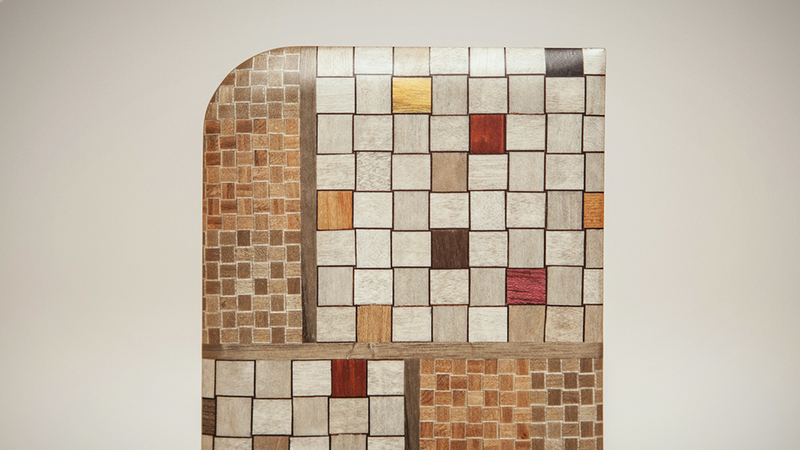 Perhaps you’ve heard about marquetry, but do you know exactly how it’s made? Keeping in mind the vague imagery of a wooden puzzle, I play around with shapes and use cross-sections to make small squares, rectangles, and triangles. Using these cross-sections, I make a kind of blueprint and then crimp it with special adhesive. From there, the two primary techniques are cutting out shapes (muku) and sharpening them and then pasting them onto a plane (zuku). It’s not about certain pieces being more precious than others; the technique of zuku is what allows the entire piece itself to consist of such lively miscellaneous parts, to be able to feel as smooth as a tray or even water, and to form such fluid curves in the surface. And it is the technique of muku that gives the finished product its petite and fine character. The inspiration for these sake bottles is “very easy to understand,” or, in other words, simple and silly. It all started when Mr. Fuyuki from SATO CERAMICWARE went to visit his clay-master friend. Charged with the vigor of alcohol, the two men started discussing sake bottles. “Why do you think that people are so fascinated with bottles and tea utensils? It is because the curves of these products are evocative of a woman’s curves, the most beautiful thing that could be mimicked,” said the clay master. This was the talk of a drunkard, yet Fuyuki-san pondered over this notion until he decided, why not make a bottle that is literally modeled after a woman’s body? This casual encounter is what got him to venture into previously unexplored territory and create this irresistible sake bottle. 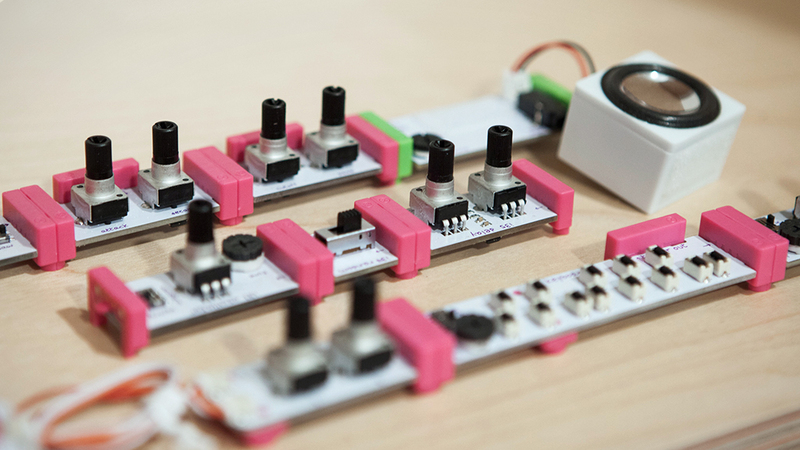 Legendary artists have been using analog synthesizers for decades to produce complex sounds and innovative music, but for the first time ever, the littleBits Synth Kit will enable anyone to build their own sound machines with little to no engineering or musical knowledge. 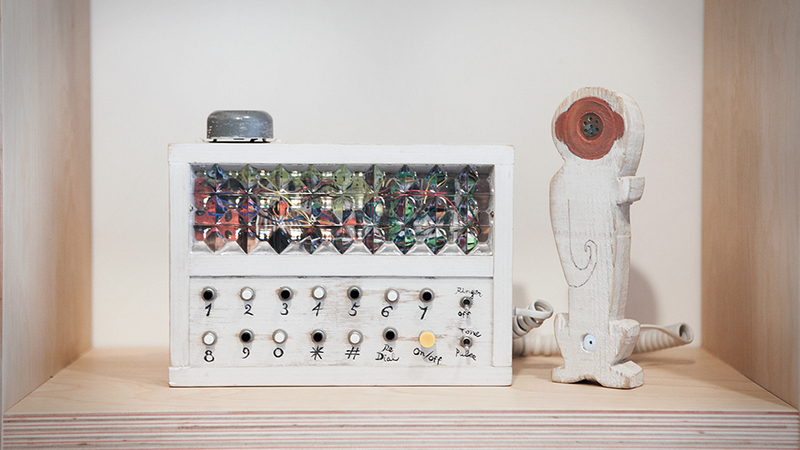 All it takes is an interest in music technology and an inclination toward experimentation. Developed in partnership with Korg, a pioneer of electronic musical equipment, the Synth Kit includes an assortment of 12 electronic modules (“Bits”) that snap together magnetically to create circuits, just like playing with LEGOs. The littleBits Synth Kit has been praised for revolutionizing the way people interact with technology by breaking down electronics into their most basic parts and making engineering accessible to "non experts" of all ages. Combine littleBits with other kits, connect it to external devices, and unleash your inner rockstar. Meet Kundali. He is one of five the Wisdom Kings in Buddhism. Depicted as an angry figure with three eyes, eight elbows, a snake entwined around his body, and a variety of intricate pieces of armor, he is meant to protect you from all disasters. It is said that his angry facial expression is so frightening that he is able to stab the heavens with his gaze. This figure may be small in size, but its ornamentations and details are grand. The long crafting process behind the Kundali figure requires refined sculpting skills and patience in order to achieve such a detailed representation. 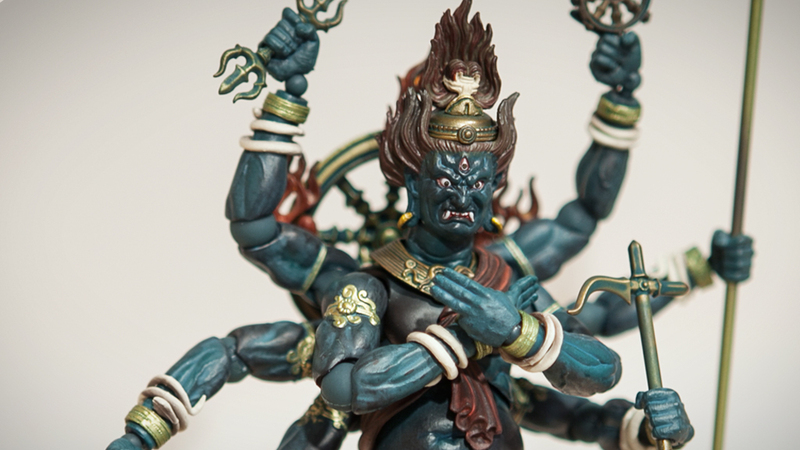 Such artistry, along with complex painting techniques that produce the unique shades of blue-green and gold, are what allow this small figure to radiate the glorious powers of Kundali. Usually, a figure of such high quality and fine work sits displayed on a pedestal and is not meant to be touched, but with 39 joints for a wide variety of poses, this Kundali figure begs to be played with. 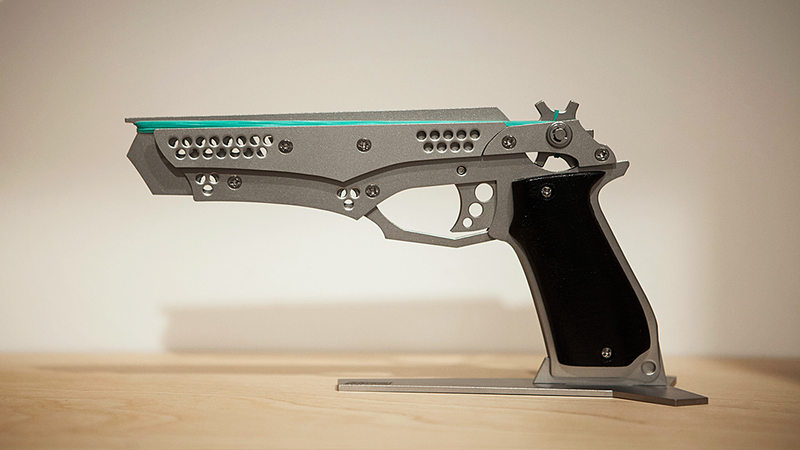 In 2009, Kazuki Nizuma launched the intricately crafted rubber band gun, which he titled the “Fenrir,” and since then it continues to be a best-selling toy gun. The fact is, there are no other competitors of this caliber. The elegance of this semi-automatic eight-barrel gun is what elevates it to a grander level than just a toy that shoots rubber bands. The stainless steel laser-cut plates have been sandblasted for an attractive and subdued, dirt-resistant shine. Nizuma’s concept was to make you want to look at the product from every angle, and he cut holes from all five plates so that you could peek inside and get a sense of the frame structure’s intricate details. You can tell by observing the simplified, lightweight appearance and thorough movements that it was made by gentle hands. When you hold it, there is something about the overwhelming sense of weight of this harmless and beautiful toy that stirs the heart. If you lament the digital age of music and crave the excitement of holding a new album in your very own hands, then this project is for you. 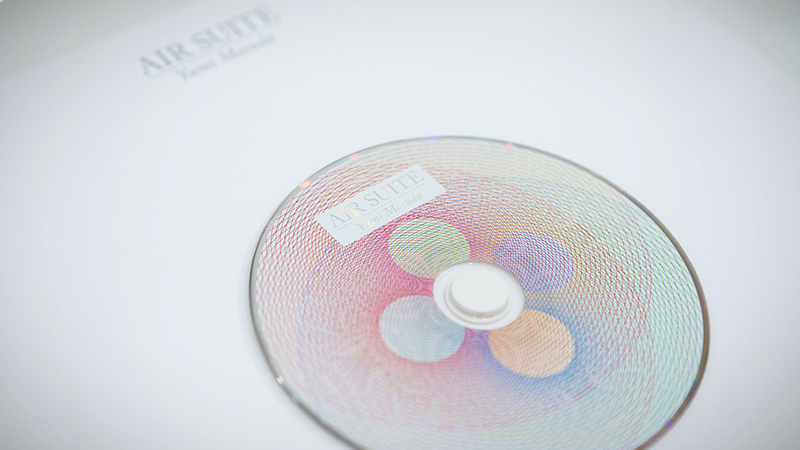 The concept of recreating the physical and visual experience of a hard-copy album has been utilized by Gravure Projects with Air Suite, the launch project for the Idea Meets Music Project. The Suite includes original songs that were recorded in Los Angeles and a limited edition book with photographs and illustrations. Taking the physical shape of a 12-inch LP record, the project evokes a sense of nostalgia mixed with a new, contemporary feel. The five international creatives who poured their souls into this album---Morihiro Harano (creative director and composer), Yumi Masuda (singer), Alex Freund (fashion photographer), Lisa Mosko (fashion director), and Deanne Cheuk (illustrator)--- ensured that this audial and visual adventure would be impossible to experience from a digitally downloaded album. The world is full of sneakers and leather shoes. It is rare, however, to come across a pair of shoes that truly captures the form of sneakers while also retaining the high quality craftsmanship of classic leather shoes. Designed by Hender Scheme, the handmade Nike Air Forces exemplify this rarity. 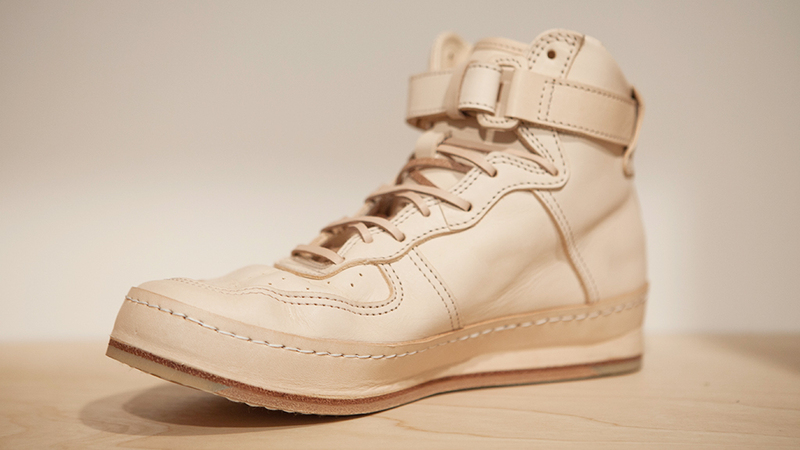 They also differ greatly from other leather sneakers in that the entire shoe is made from tanned natural leather instead of synthetic leather. Synthetic leather is thin and does not change shape, but natural leather is thick and stretches after being worn, requiring a very particular binding process in order to prevent unwanted edges. For these shoes, a group of skilled leather shoe craftsmen joined forces to design this one of a kind shape. Wearing these shoes, you will be able to feel the hard work and refined skills that went into their making. Natural leather changes with time and wear, so these sneakers will change with you, like a true companion. Mikiko Minewaki approaches jewelry design in a unique way. She collects objects that people interact with daily (including lighters, pens, cell phones, and toys), carefully cuts them into smaller pieces, and strings them together to create original jewelry pieces. 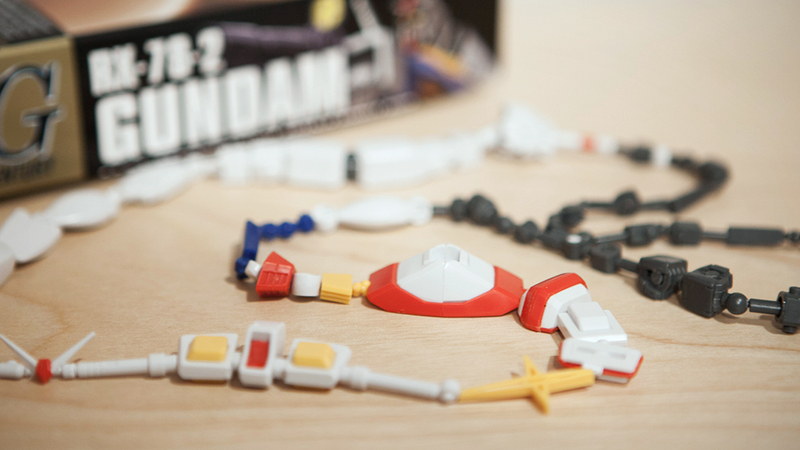 This necklace was made from parts of “Ganpura,” a plastic model toy from the popular space anime, Gundam. This piece is sure to delight Gundam fans as well as anyone with an appreciation for gentle and amiable charm. Satomi Den’s glass objects tend to be colorful, feminine, light, and simple. 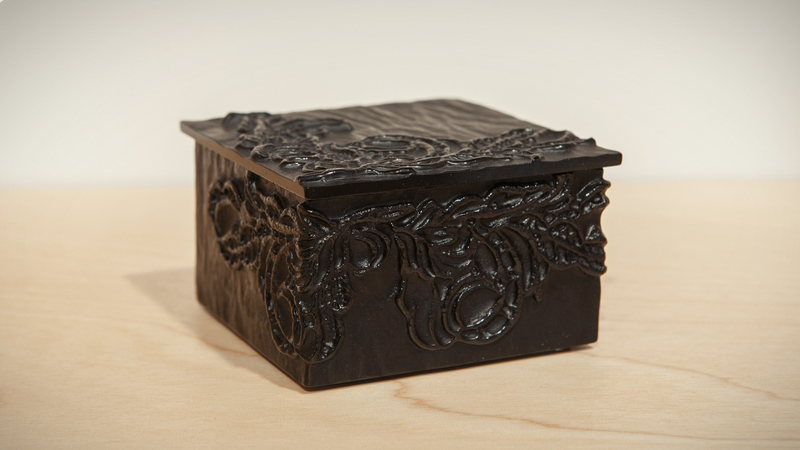 But her “Black Lace Box” provides a window to her darker side, appearing to be heavier and more masculine than any of her other pieces. The box’s lace design might make it seem feminine after all, but lace was not always considered to be feminine; back in B.C. era Egypt, it was used as an ornamental piece for male Priests, and slowly it became used in Europe as a design that represented royal family crests. By playing with this gender ambiguity, Den has created a charming box that is audacious and gallant in character. This series of three katakana rings, which were inspired by mimetic words found in Japanese comics, certainly give off a strong first impression. Each ring, heavy and overflowing with character, looks like it could capsize. 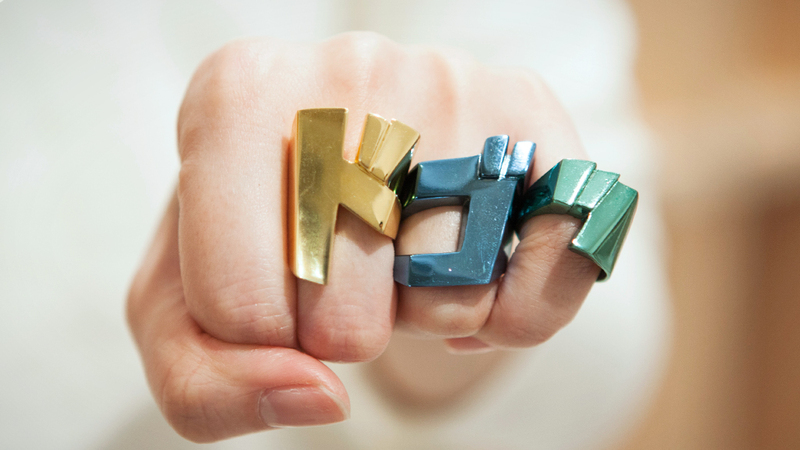 When you think about it, the idea of designing a ring to express an onomatopoetic word is a thought-provoking concept. The designers at RGB came up with the idea for these rings not by starting with an explanation or theory, but by merely imagining the impact that the final product would have. When you wear the rings, their forceful presence is guaranteed to draw attention and curiosity. In Japan, it is a custom to wrap congratulatory money in special envelopes. There are a myriad of designs available, but it is often difficult to find the perfect envelope to match the warmth you feel for the person being celebrated. 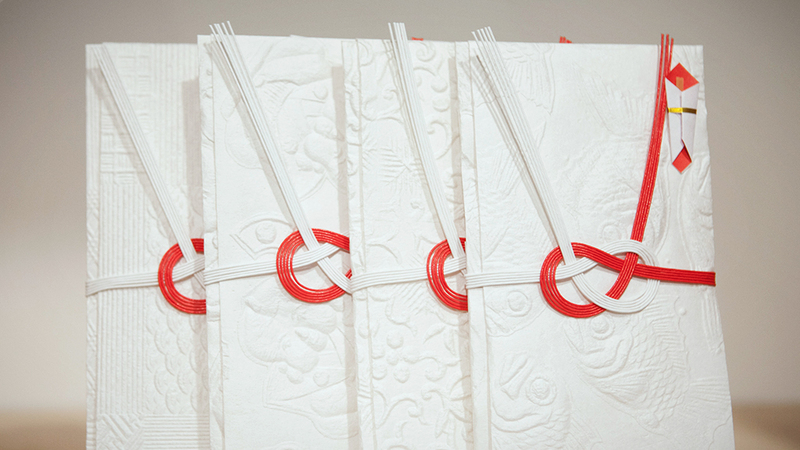 Beautifully embossed by the hands of Tetsuya Nagata, these four envelopes stand out for their simple charm and elegance. Each envelope bears meaning of its own: the comical “sea bream” is sure to make anyone smile, the “dwarf” is meant to bring good luck, the “foliage scroll” communicates comfort and warmth, and the “lattice grid” is a mature and elegant design perhaps best to be given to your mentor. With each envelope embodying such subtle differences, you must consider factors such as age, season, and occasion when selecting which one to use. What an enigmatic little thing. This small case, which can be used as a wallet or to hold business cards, makes you think it was stripped from the exterior wall of a roughly painted building, folded, and sewn together. Indeed, by coating leather with industrial house paint, the designer’s intention was to take an everyday object and whimsically alter it by using an unexpected material. Wallets and painted walls are both things we interact with daily, but you would never expect one to be made from the other. 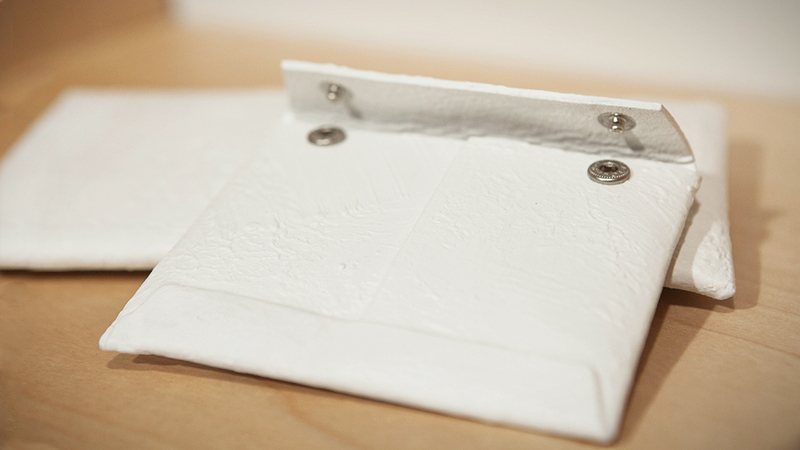 The material also allows the wallet to build character as you use it, just as a painted wall changes as it becomes victim to time. It is a true wallet. 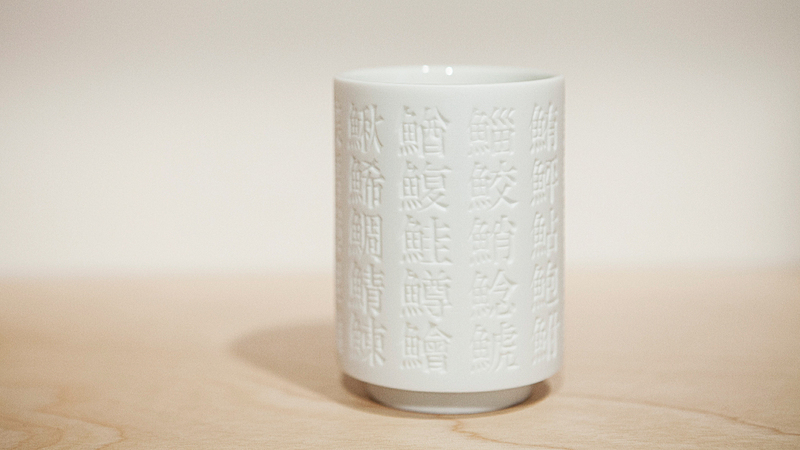 This elegant white cup has been grazed with inscriptions so gentle that they are almost bound to be overlooked. If you look closer and inspect these delicate shadows, you will notice the characters displaying the names of different kinds of fish (that is, if you can read kanji), and you might realize that this design is a variation of a very common Japanese cup that is typically served with sushi. These cups have become so standardized and faded into the background of our everyday existence that the designer felt the dire need to give them a fresh new life. Usually, the characters are painted in a shade of indigo, but the designer reinvented the cup by carving the characters instead, creating meaning through shadows. The alteration may seem minimal, but the effect is significant.